This tutorial video shows you how to name compounds with a ‘CHO’ or aldehyde functional group using my puzzle piece approach to IUPAC naming. 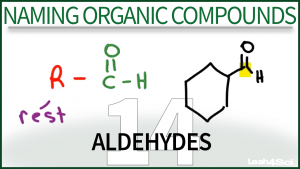 This is Video 14 in the Naming Organic Compounds Video Series. Click HERE for the entire series. Your videos are once again awesome. How did we get cyclohexanecarbaldehyde? I don’t understand where “carbaldehyde” came from – if it is a substituent, shouldn’t it be in front of the parent name? why is it phenyl rather than benzene ?